After Satan is hurled into the lake of fire, the apostle John sees a great white throne at some unknown location that is not of earth or heaven (Rev 20:11). In this second resurrection, the rest of humanity, who were not of the first resurrection, come to life and present themselves before Jesus Christ the Judge (Acts 17:30-31; Rev 20:12). Believers, whose souls in heaven join with their glorified bodies, come to life (Rev 20:12). Non-Believers, whose souls in hell join with their bodies, come to life (Rev 20:13). Each person was judged by a) looking for their name in the Book of Life and b) evaluating their life in the books that recorded their deeds (Rev 20:12-13; Matt 7:21-23). Believers, evaluated in accordance to their deeds, were rewarded for their faithful service (Rev 20:12; Matt 19:28; Luke 22:28-30). Non-Believers, their names not written in the Book of Life (Rev 20:13), were thrown into the lake of fire (Rev 20:15). While its location is not specified, the lake of fire is the final place for the Antichrist, False Prophet, Satan, and non-Believers, and it is a place of torment and without any rest. 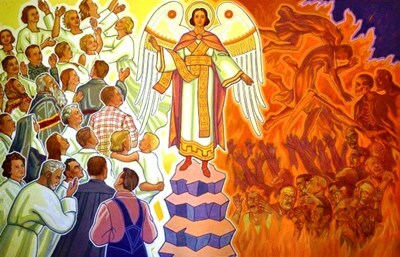 In the very end, death and Hell are also thrown into the lake of fire (Rev 20:14). With the end of death, introduced by Adam’s sin, and evil, introduced by Satan, the apostle John sees a new heaven and a new earth (Rev 21:1).